It opened with a bang; it exceeded all British expectation and the London 2012 Olympics is now at an end. The City of Birmingham Gymnastics Club are proud to congratulate both coach, Lisa Higgins and gymnast, Francesca Jones, for their preparations for and performances at the London 2012 Olympic Games. Francesca made creditable performances and achieved her desired scores. 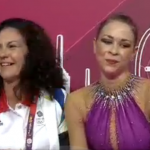 Francesca was given a wild card place via British Gymnastics as is an option of the host nation, after having achieved qualification scores at the World Championships 2011. Whilst she did not make it through the qualification rounds to the final top 12 she proved British Gymnastics right in their nomination of her and repaid them by performing at her best and showcasing the standard of British Rhythmic Gymnastics; a huge well done on making London 2012. What a dream come true; what an experience; what an honour and a privilege to represent GB at an Olympic Games! !